Well, here we are. Hopefully the first of many blogs to keep people up to date with progress at our two sites. 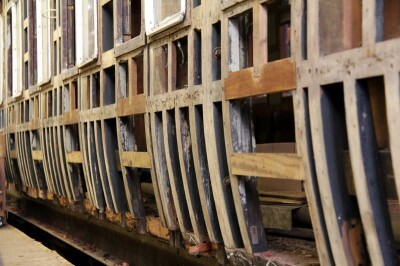 I was at Rowsley this Saturday (4/3/12) and made a bit of progress loose fitting some new framework to 7828. These will be replacement sections that go under the droplights. The previous framing having been water damaged or cut out from long ago! In the picture you will see that the front edge of the bottom stringer has also been cut away due to local water and ‘screw’ damage, ready to have new facing wood put back. There is still plenty to do, but steady progress is being made.